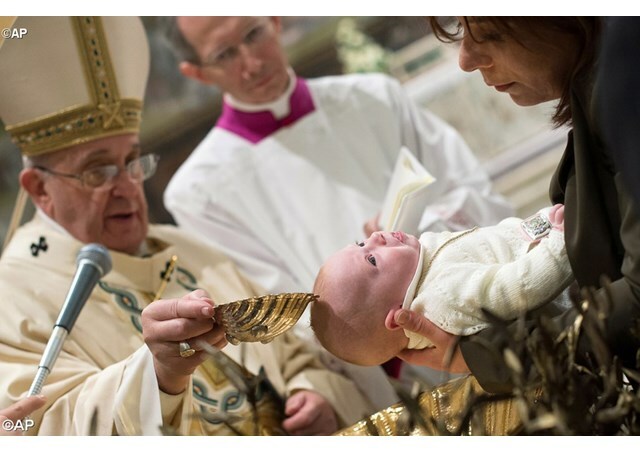 In the Sistine Chapel on January 7, 2018 Pope Francis baptized 18 baby girls and 16 boys. He celebrated the Holy Mass for the Baptism of Our Lord. You have brought your children to receive the Sacrament of Baptism. This is the first step in the task you have to fulfil: the task of transmitting the Faith. But we need the Holy Spirit to transmit the Faith, we cannot do it alone. Transmitting the Faith is a grace that comes from the Holy Spirit and this is why you bring your children here to receive the Holy Spirit, to receive the Trinity - the Father, Son and Holy Spirit – who will dwell in their hearts. But do not forget this: if the “dialect” is missing, if at home you do not speak the language of love between parents, the transmission of the Faith is not so easy, it cannot be done. Do not forget. Your task is to transmit the Faith, but to do it with the language of the love of your home, the language of the Family. Children too have their own dialect, and it makes us feel good! Now they are all quiet but if just one sets the tone, then the orchestra will follow! The language of children! And Jesus asks us to be like them, to speak like them. We must not forget this language of children, to communicate like they do. It is a language that Jesus appreciates so, in your prayers, be simple like they are: tell Jesus what is in your heart, like they do. Today they say it with tears but, yes, be like children. The language of parents must be the love with which they transmit the Faith, and the language of children must be to receive that Faith from their parents and to grow in Faith. Now we will continue with the ceremony and if the children start the concert (by crying), it is because they are uncomfortable or because they are too hot or feel hungry. If they are hungry, feed them. Don’t be afraid. Go ahead and feed them. This too is the language of love.